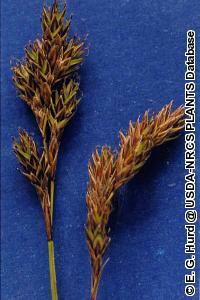 Carex praticola is endemic to North America and has a wide transcontinental range. The species can be common in portions of the North and West but it is uncommon to rare in eastern North America. It was first documented in Minnesota in 1936, but as of 2008, only nine additional occurrences had been documented in the state. All but one of the occurrences is from the Rove Slate Bedrock Complex Landtype Association of northern Cook County. This landtype occurs in the rugged Middle Precambrian Rove Formation and is characterized by its rugged topography, numerous long, east-west oriented lakes and ridges, and steep north-facing cliffs and talus slopes. The geology is comprised of sedimentary deposited shales and graywackes capped and intruded by diabase (basalts). The area's unique geology and associated topography provide the substrates and microclimates needed by C. praticola and an assortment of other rare species in Minnesota. The one discrete C. praticola population from outside the Rove Formation was recorded on June 30, 1979 growing in sandy soils near Isabella Lake in Lake County. Like most of the known populations of this species however, it has never been relocated. Thus, the significance of this collection remains difficult to determine. Future surveys may help establish if C. praticola does indeed occur in sandy habitats or if other populations occur outside the Rove Formation, although recent extensive botanical surveys of the cliffs and talus of the North Shore Highlands subsection did not encounter this species. Carex praticola was originally listed as a threatened species in Minnesota in 1984, but it was reclassified as special concern in 1996 given the rugged and remote nature of its habitat. Carex praticola is a cespitose (growing in tufts) sedge in the taxonomic section Ovales. Ovales is well known to be a challenging group of plants to accurately identify even for the seasoned botanist, requiring close examination and measurement of mature floral parts. Carex praticola has pistillate scales that are as long as or longer than the mature perigynia. The scales typically conceal the perigynia beak tips but are narrower exposing the sides of the perigynia. The beak of the perigynia is rather unique in being cylindrical (versus flat) and entire (not toothed), extending from the narrowly winged margins of the perigynia. Although the beak is less than 1 mm (0.04 in.) long, it is distinctive and under good conditions can be discerned in the field with a good hand lens (10x) and backlight. Carex praticola is most similar to C. adusta (browned sedge), C. xerantica (dry sedge), and C. foenea (hay sedge). However, C. adusta and C. xerantica have wide pistillate scales that cover the sides of the perigynia versus the narrower scales of C. praticola. Although C. foenea has narrow scales similar to those of C. praticola, the beak of C. foenea is flat and finely toothed to the tip versus cylindrical and entire. These characters can be very distinctive when working with good specimens but can become rather dubious when studying immature or poor material. Across its range, C. praticola habitats include moist to wet meadows, open dry woods, and rocky areas (Mastrogiuseppe et al. 2002). In Minnesota, it occurs on semi-open cliffs, often near the base on small shelves and cobbly talus. It may also be found on cliff tops and on cliffs of various aspect. Although cliff habitats occur in different ecological subsections of Minnesota (Minnesota DNR 2003), C. praticola appears to be nearly restricted to the Rove Slate Bedrock Complex Landtype Association of the Border Lakes subsection. These mesic cliffs are comprised of shale, graywacke, and basalts providing favorable substrates and microclimates. Associated plant species may include Saxifraga paniculata (encrusted saxifrage), Heuchera richardsonii (alumroot), and Polypodium virginianum (common polypody). Carex praticola is a perennial plant and it disperses primarily by seed. It is short-rhizhomatous growing in cespitose clumps. Populations in Minnesota are often comprised of a few, scattered clumps and they are uncommon where they occur. The best time to search for C. praticola in northeastern Minnesota is late June to mid-July. Although we know that C. praticola is rare in Minnesota and it occurs as small, scattered populations on cliffs of the Rove, we understand little of the species biology and ecology. Many questions remain unanswered including: what are the population dynamics of the cliff populations; how may the species be affected by major wind events, such as the July 4, 1999 blowdown, and the wildfires that follow; are the populations safely sheltered on remote cliffs or are changing forest conditions also changing the microclimates of these sensitive habitats; and how vulnerable are the seemingly remote populations to competition from the wind born establishment of non-native species such as Tanacetum vulgare (common tansy), Taraxacum officinale (common dandelion), Elymus repens (quackgrass), or some species of Hieracium (hawkweeds)? Well-designed monitoring efforts are necessary in order to better understand species ecology and how populations are responding to our changing environment. The Rove Slate Bedrock Complex Landtype Association has long been known for its botanical diversity and suite of rare species. Most recent survey efforts in this geographical area were completed in 1999 (Gerdes 2001), during which several new locations of C. praticola were documented. Additional plant surveys are currently underway in the Rove, where it is likely additional populations will be documented, and in adjacent areas of the Border Lakes subsection. The bigger questions may be where else may the species occur, what is the health of known populations, and will C. praticola still occur in Minnesota in another 75 years? All of the known C. praticola populations in Minnesota are located within the Boundary Waters Canoe Area Wilderness and most are located on rather remote cliff features, which may offer some level of protection. Gerdes, L. B. 2001. A contribution to the flora of the Rove Slate Bedrock Complex Landtype Association, northern Cook County, Minnesota, U.S.A. Thesis, Michigan Technological University, Houghton, Michigan. 79 pp. Mastrogiuseppe, J., P. E. Rothrock, A. C. Dibble, and A. A. Reznicek. 2002. Carex sect. Ovales. Pages 332-378 in Flora of North America Editorial Committee, editors. Flora of North America north of Mexico. Volume 23. Oxford University Press, New York, New York. Minnesota Department of Natural Resources. 2003. Field guide to the native plant communities of Minnesota: the Laurentian mixed forest province. Ecological Land Classification Program, Minnesota County Biological Survey, and Natural Heritage and Nongame Research Program. Minnesota Department of Natural Resources, St. Paul, Minnesota. 352 pp. Voss, E. G. 1972. Michigan Flora: Part I Gymnosperms and Monocots. Cranbrook Institute of Science Book 55, Bloomfield Hills, Michigan. 488 pp.